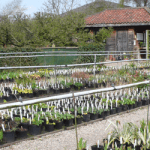 We have had a very busy winter in the garden, replanting part of the garden as well as removing trees damaged by last summer’s drought. Several visitors commented that the area where we had planted most of our pulmonarias was boring in the summer! Certainly not so in the spring, but we have taken that on board and moved all the pulmonarias to an area near the stock beds so they are still there for visitors to admire. 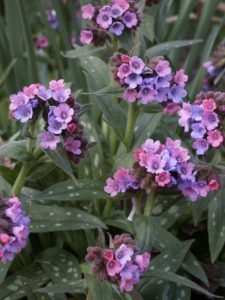 The Pulmonaria area is now replanted with mainly white and yellow shrubs and herbaceous plants mixed with a sprinkling of bulbs, which we feel will have interest all through the summer. The hedge round the meadow has had a severe hair-cut and some willows have had to be removed as they had suffered from lack of water and others cut hard back. Time will tell if they will recover but the meadow now receives more sunlight. 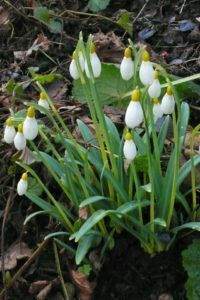 As I write this the garden is full of snowdrops, I have been collecting for sometime and at last some of the named forms are making large clumps and you realise why they have been named, often much taller, with larger flowers and interesting foliage. I still love the woodland walk which is covered with un-named snowdrops which originally came from my mother’s garden. 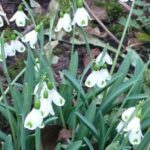 Perhaps we may even have a snowdrop opening sometime!